Shear wave elastography(SWE) is a relatively new, promising modality which enables detailed information about tissues mechanical properties . Hamartomas are relatively rare, soft benign breast lesions comprised of glandulary and stromal components. The importance of radiological imaging methods increases especially in cases who do not have the typical appearance of hamartomas . Mammography and sonography are effective methods in evaluating morphological features of lesions. However, typical hamartoma appearance can not be identified in breasts which are composed of dense parenchymal pattern, mammographically. Moreover conventional methods can not reveal stiffness of the lesions. The diagnostic performance may improve by integration SWE into conventional methods in breast lesions. We presented SWE, sonography and mammography findings of patient with giant hamartoma. A 50-year-old female patient who regulary followed admited to radiology department. On physical examination, a mass lesion was palpated in her left breast. 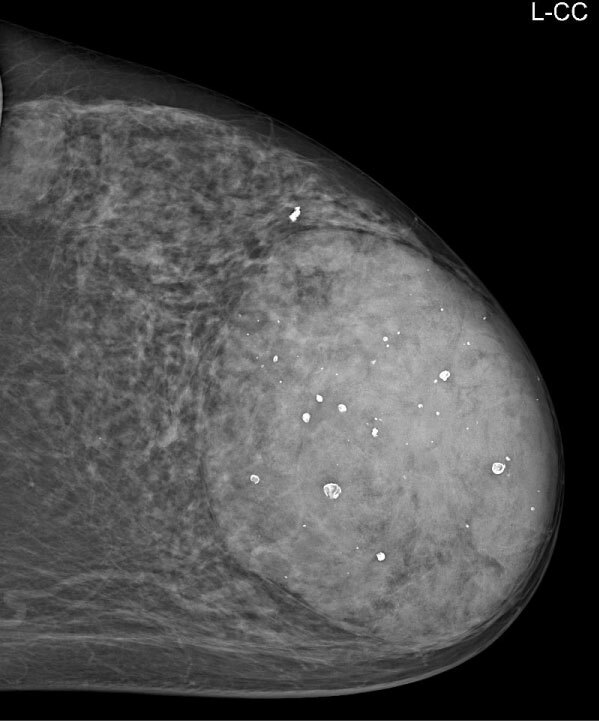 A large well-circumscribed mass filling retroareolar region of left breast was detected on mammography (Figure 1). 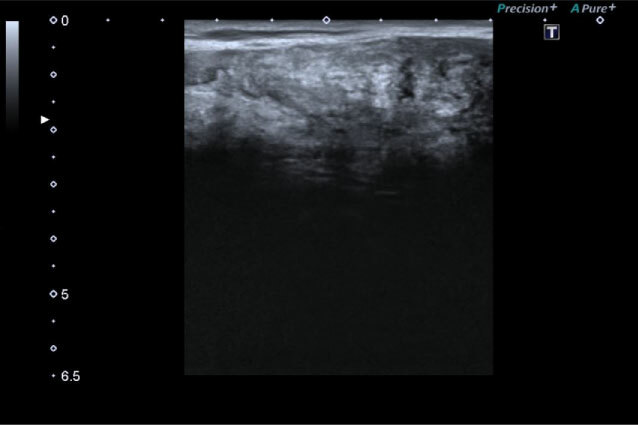 A heterogenous, hypoechoic mass lesion was sonographically detected on the left breast in diameter 13 cm (Figure 2). The lesion was proved as fibrosis histopathologically and did not progress in mammographic and sonographic follow-up for 5 years. SWE was performed to the lesion whose mammographically and sonographically findings suggesting hamartoma. Many soft areas within lesion were noted on color elasticity mapping. Mean elasticity value was 2.44 m/s and 17.9 kPa on consecutive measurements. Obtained elasticity values was compatible with normal breast parenchyma (Figure 3). Hamartomas are generally in the form of soft mobile masses on physical examination . Elastography is the sonographic equivalent of palpation on physical examination . Recently, elastographic measurements were integrated into Breast Imaging Reporting and Data System (BI-RADS) by American College of Radiology . Thus, SWE may be helpful to recategorize lesions on conventional B-mode ultrasound. SWE increases diagnostic performance of USG in distinguishing breast cancer from benign masses . SWE can discrimate malignant breast lesions from benign with a 86.5% sensitivity, 89.8% specificity, and 88.3% accuracy . Seo, et al. reported that the combination of B-mode US and SWE is significantly increased the diagnostic performance compared with B-mode US alone. In various studies; the reported cutoff values for discriminating malignant breast lesions from benign lesions are ranged from 33 to 93.8 kPa [8,9]. Our patient elasticity value was 17 kPa on consecutive measurement, which was compatible with the recent literature data. Hamartomas are benign lesions but may have atypical appearances and may cause unnecessary biopsy. Especially, he typical hamartoma appearance can not be identified in breasts which are composed of dense parenchymal pattern. Additionally, the more fibroglandular tissue a hamartom contains, the more mammographically it appears to be dense; which can cause the hamartoma to interfere with the fibroadenoma  In our patient; hamartoma was mammographically seen as a well-circumscribed dense mass lesion. Sonographically, hamartoma was visualized as a heterogeneous, pseudo-capsuled breast tissue composed of fat and fibroglandular tissues. Measured elasticity values were similar to normal breast parenchyma and emphasised the diagnosis of hamartoma. As a matter of fact; hamartomas are disorganized breast tissue composed of fat and fibroglandular tissue . We assume that SWE can enable additional information in difficult cases which have not classical appearances and support the diagnosis. In conclusion; SWE can be considered as an assistant tool for accurate diagnosis in hamartoma. Bai M, Du L, Gu J, Li F, Jia X (2012) Virtual touch tissue quantification using acoustic radiation force impulse technology: initial clinical experience with solid breast masses. J Ultrasound Med 31: 289-294. Rohini A, Prachi K, Vidyabhargavi (2014) Multimodality imaging of giant breast hamartoma with pathological correlation. International J of Basic and Appl Med Sci 4: 278-281. Tatar C, Erozgen F, Tuzun S, Karsidag T, Yilmaz E, et al. (2013) Surgicalapproach to breast hamartoma and diagnostic accuracy in preoperative biopsies. J Breast Health 9: 186-190. Barr RG (2012) Sonographic breast elastography: A primer. J Ultrasound Med 31: 773-783. Mendelson E, Bohm-V-elez M, Berg W, Merritt C, Rubin E (2013) ACR BI-RADS: ultrasound. In: Breast Imaging Reporting and Data System. 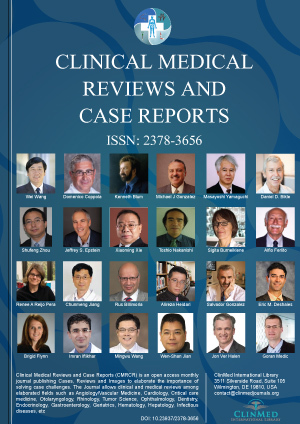 ACR BI-RADS Atlas, American College of Radiology, Reston, VA.
Itoh A, Ueno E, Tohno E, Kamma H, Takahashi H, et al. (2006) Breast disease: Clinical application of US elastography for diagnosis. Radiology 239: 341-350. Seo M, Ahn HS, Park SH, Lee JB, Choi BI, et al. (2018) Comparison and combination of strain and shear wave elastography of breast masses for differentiation of benign and malignant lesions by quantitative assessment: Preliminary study. J Ultrasound Med 37: 99-109. Youk JH, Son EJ, Gweon HM, Kim H, Park YJ, et al. (2014) Comparison of strain and shear wave elastography for the differentiation of benign from malignant breast lesions, combined with B-mode ultrasonography: Qualitative and quantitative assessments. Ultrasound Med Biol 40: 2336-2344. Youk JH, Son EJ, Gweon HM, Han KH, Kim JA (2015) Quantitative lesionto- fat elasticity ratio measured by shear-wave elastography for breast mass: which area should be elected as the fat reference? PLoS One 10: e0138074. Presazzi A, Di Giulio G, Calliada F (2015) Breast hamartoma: Ultrasound, elastosonographic, and mammographic features. Mini pictorial essay. J Ultrasound 18: 373-377. Fatma Zeynep Arslan, MD, Department of Radiology, Konya Training and Research Hospital, University of Health Science, Hacı Şaban Mah, Meram Yeni Yol Caddesi, No: 97, PC: 42090, Meram, Konya, Turkey, Tel: 0506-438-24-30, Fax: 0-332-323-67-23. © 2019 Altunkeser A, et al. This is an open-access article distributed under the terms of the Creative Commons Attribution License, which permits unrestricted use, distribution, and reproduction in any medium, provided the original author and source are credited.